My cousin Jeanna is my artistic and fashionista cousin. She helps people design their homes and I wish she was helping me to do so. Why can’t you have a piece of software that shows you what all the things you picked will look like together with your furniture in my new home? When Jeanna married her husband Jon a few years ago, I jokingly said, “I guess you can’t join this family unless your name starts with a ‘J’.” You see, all my cousins in the Bourek side’s names start with the letter J – Jenny (aka Jen or Jennifer now), Jill, Jeanna, Jodi, and Jackson. Did I mention I also have an aunt Joyce and an uncle Jerry? Little did I know, my then boyfriend Jeremiah would become my husband. Place beef, onion, chili beans, kidney beans, corn, tomatoes, tomato sauce, water, green peppers, and taco seasoning in Crockpot. Cook on low for 8 hours. Pair with tortilla chips for a crunchy finish. Jeremiah and I use no salted canned goods and tortilla chip from the health food section. This left our dish a little bland. We topped our soup with a little cheese and fresh cilantro. I think also cooking the meat with the taco seasoning could have made it more flavorful. I also wondered about maybe adding some black beans to the dish. The first time I tried Stromboli was with my Grandma Fletcher in Yuma, AZ. She took me to this little pizza place in strip mall and said, “you have to try it.” If you aren’t familiar with Stromboli, it is a turnover filled with meats, cheeses, and/or veggies. At the Minsky’s in Independence, MO, they have something similar called a Mexican Pizza Roll. I actually ended up with it by mistake one night. They gave me someone else’s order – something I realized just as they were calling me to apologize. Since they couldn’t take the pizza and pizza rolls back, I ended up trying these tasty bits that seemed to me like a Mexican Stromboli. Since I no longer live in Independence, it is a rarity that I make it back over to the only Minsky’s location I know to make these delicious bites. I ran across this recipe on Pinterest some time ago. I forgot about it until Jeremiah and I were looking for some new recipes in my Pinterest boards before we headed out to buy groceries. It’s good but I still miss the Mexican Pizza Rolls at Minksy’s. Cook a pound of ground beef. Drain the grease. Add packet of taco seasoning and 1 cup of water. Cook until a boil and reduce heat to low. Simmer for 10 minutes. Layout pizza dough and form into a rectangle. Cut in edges in strips about 3 inches in on each side using a pizza cutter. Spread with refried beans in the middle of the crust. Top with cooked taco meat. Spread with salsa. Sprinkle with cheese. Lace up crust and bake at 375 degrees for 20 minutes. I used half the can of refried beans. I used about ¾ lb. of ground beef. I used Wildtree Taco seasoning. I only used about 1 cup of cheese. It was a mix of mozzarella and cheddar cheese. I wish I had prepared it on the pan or foil as it was difficult to transfer to the baking sheet. I’d also suggest maybe not buying the store brand of pizza crust as it tends to come apart a little easier than the Pillsbury brand. My fiancé suggested we kick it up a notch. Perhaps by adding some cilantro or green onion to the bake. Jeremiah added some spicy salsa on top before eating his second piece. We also said guacamole or sour cream on top would be delicious. Yes, this is another Doritos recipe. Apparently, I have so many on my blog that my coworkers bought Doritos to celebrate my b-day. But I have to tell you, it is my favorite of the casserole versions I’ve made. You can’t go wrong with crescent rolls as a base. Brown hamburger and drain. Add taco seasoning, tomato sauce, and tomatoes. Bring to a simmer. Line a 13 x 9 pan with crescent rolls. 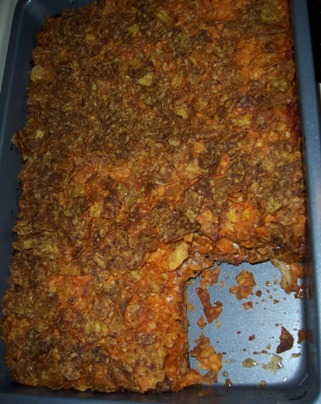 Top with hamburger mixture, sour cream, cheese, and Doritos. Bake at 350 degrees for 30 minutes. I used reduced fat crescent rolls, fat free sour cream, no-salt added tomato sauce, and 2% cheese. You could use 93% fat-free ground beef or ground turkey to make it healthier. I accidently add the whole can of Red Gold diced tomatoes (14.5 oz.). It still turned out fine. I used a ½ bag of Doritos and it was more than enough. Another option would be to use Baked Doritos. I baked the crescents for 7 minutes before adding ingredients. I do this to prevent a doughy crust. My sister was telling me a story about how she heard on the news that the Dorito Loco Taco increased sales at Taco Bell by 435%. Talk about taco crazy. But let’s be honest, who doesn’t love Doritos. Do I buy like I did when I was a kid? No, not really. 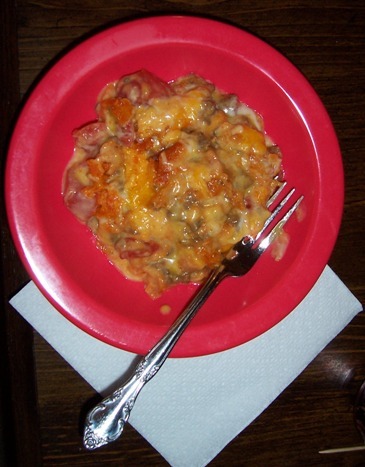 But when I saw this recipe for a Doritos Casserole, I knew I wanted to make it. This recipe is from my Perfect 10 Cookbook. Author Debbie Kraft said she first tried it at her sister-in-law’s house. Debbie refused to leave until she had a copy of the recipe. I hope you enjoy it as well. Brown hamburger with onions. Drain off grease. Add taco seasoning and salt. In a seperate bowl, combine soups, milk, and tomatoes and mix well. Grease a 2 qt. casserole dish. Layer Doritos, meat, and soup. Repeat one more time. Bake at 350 degrees for 30 minutes. Remove from over and sprinkle with cheese. Bake another 10-15 minutes til cheese is melted. If desired, garnish with sour cream and ripe olives. I didn’t have onions so I made it without. I was also out of Ro-Tel so I substituted diced tomatoes. I wasn’t sure what a medium bag of Doritos was so I used have a super bag (from Sam’s Club). I think you might also be able to use Baked Doritos. The soup mixture is pretty soupy. I think you can use Fat-Free or Reduced Sodium soups without messing up the recipe thickness. I used skim milk and fat free shredded cheddar cheese.